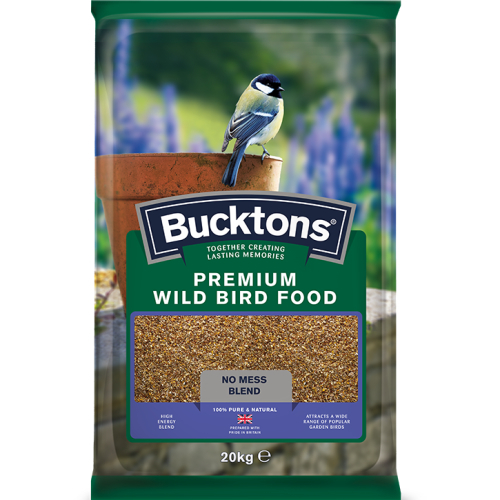 Bucktons Premium Wild Bird Food is a 100% pure and natural, nutritious, no mess formulation. This high energy blend attracts a wide range of garden birds and has been designed to be fed through feeders or on bird tables. Cut Maize, Red Millet, Canaryseed, Kibbled Peanuts, White Millet, Red Dari, Hulled Sunflower, Hempseed, White Dari, Naked Oats, Flakes Maize, Kibbled Green Peas, Jap Millet, Nigerseed and Safflowerseed.